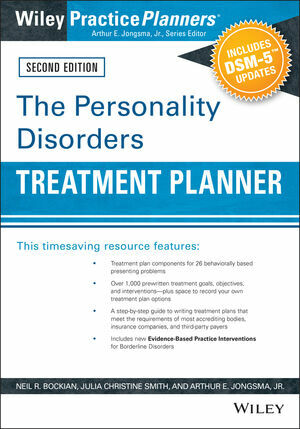 The Personality Disorders Treatment Planner, 2nd Edition is fully updated to meet the changing needs of the mental healthcare field. A time-saver for psychologists, counselors, social workers, psychiatrists, and other mental health professionals, this new edition offers the tools you need to develop formal treatment plans that meet the demands of HMOs, managed care companies, third-party payors, and state and federal agencies. Organized around twenty-six presenting problems, the easy-to-use format and over 1,000 prewritten symptom descriptions, treatment goals, objectives, and interventions makes the task of developing an evidence-based treatment plan more efficient than ever. The treatment of mental health disorders is rapidly evolving, and new evidence-based protocols are being adopted by federal and state organizations. You are now required to closely monitor patient progress, and you may feel pressure to stick to standardized care and reporting procedures; however, you can only do so if you have access to the latest in evidence-based treatment plans. An Appendix demonstrates the use of the personality disorders Proposed Dimensional System of DSM-5. NEIL R. BOCKIAN, PhD, is a Professor at Adler University in Chicago. He studied personality disorders with Dr. Theodore Millon and mindfulness meditation with Jon Kabat-Zinn. He is the lead author of two other books on personality disorders and has extensive experience treating individuals with personality disorders and individuals with medical conditions such as spinal cord injuries and chronic pain. He utilizes individual, couples, and group therapy, as well as hypnosis, relaxation training, neurofeedback, and mindfulness meditation in his practice. JULIA C. SMITH, Psy.D, is a Staff Psychologist for the Department of Veterans Affairs, an Assistant Professor in the Department of Psychiatry at University of Texas Southwestern Medical Center, and the Assistant Training Director for psychology training programs offered through the VA North Texas Health Care System. She specializes in the treatment of PTSD and co-occurring substance use disorders. ARTHUR E. JONGSMA, Jr., PhD, is the Series Editor for the bestselling Wiley PracticePlanners®. Since 1971, he has provided professional mental health services to both inpatient and outpatient clients. He was the founder and director of Psychological Consultants, a group private practice in Grand Rapids, Michigan for 25 years. He is the author or coauthor of over 50 books and conducts training workshops for mental health professionals around the world.